Nine crews bidding for the 2016 EFG Sailing Arabia – The Tour crown were officially presented at Palm Jumeirah in Dubai today and given extra incentive to push for victory when racing starts on Monday with the unveiling of the new specially commissioned trophy. The nine crews will then sail to Abu Dhabi on February 15th, where a thrilling inport is set to take place at Emirates Palace Marina on February 17th. After a few days of training in one-design Farr 30 boats, the crews representing Oman, Kuwait, Germany, Great Britain, Monaco, the Netherlands and Switzerland attended a press conference where each skipper was presented, as they prepare for a battle that is expected to be tougher and more competitive than ever. The standards are higher this year, skippers commented, after specialist skills were signed up across all the teams to boost point scoring opportunities in both offshore and in port racing. Based on past form, EFG Bank Monaco are the clear favourites having won in 2014 and last year though according to French skipper Sidney Gavignet, his newly-assembled crew will have to work hard to maintain their ‘win’ record. “I think this might be the best EFG Sailing Arabia – The Tour yet because the standard is higher and there are some very good teams this year who are bound to give us a run for our money,” said Gavignet. In particular, Al Mouj, one of the new Omani teams, skippered by Gilles Favennec, could spring a surprise in the three in port races in Dubai, Abu Dhabi and Doha since they are talented and experienced short course campaigners. And Marcel Herrera’s Team Averda from the UK were runners up in 2015 and have returned with their sights set on becoming the first team to lift the brand new trophy which was specially commissioned from British Royal Warrant holder and goldsmiths Thomas Fattorini Ltd. 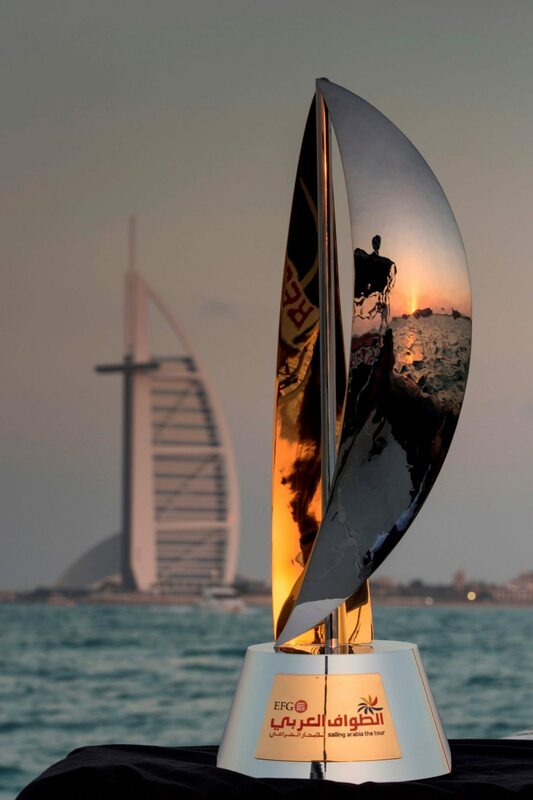 Designed as a modern and elegant representation of maritime themes, the trophy will be awarded annually to the EFG Sailing Arabia – The Tour winner and kept safely between events at Oman Sail’s headquarters in Muscat. Scaled versions will also be made for the skippers to keep and are set to become coveted collector’s items in maritime trophy cabinets around the world. The trophy was unveiled at a press conference at Palm Jumeirah along with the nine teams, which also include the all women’s crew Oman Airports-Al Thuraya Women’s Team (Oman), skippered by the popular Dee Caffari and Renaissance Services, with Oman’s most celebrated sailing stars and world-record breakers Fahad Al Hasni and Sami Al Shukaily leading from the front along with the formidable Nasser Al Mashari, who was on the Omani team that recently won the 2015 Extreme Sailing Series in Sydney, Australia. They are raring to go and will go into battle on Monday following a special opening ceremony which will be attended by guest of honour His Excellency Mirza Hussain Al Sayegh, Director of the office of His Highness Sheikh Hamdan bin Rashid Al Maktoum. In the first of three in port racing rounds over the next two weeks, they will all be chasing early points with Wouter Sonnema’s TU Delft Challenge (NED), Team Bienne Voile skippered by Lorenz Mueller (SUI), Martin Felgenhauer’s Mangold (GER) and Team Zain (KWT) skippered by Cedric Pouligny keen to start the first offshore leg to Abu Dhabi on Tuesday with vital points in the bag. At the press conference, Salma Al Hashmi, Marketing and Events Director commented: “Oman Sail created this event to give sailing a new home in the Gulf, to show the capability of the region as a world class host, to reconnect local sailors with their maritime history and to provide international sailors with an alternative training destination during the cold European winters.